"Better Living Through Chemistry" is the kind of film you make when you don't have a better film to make. 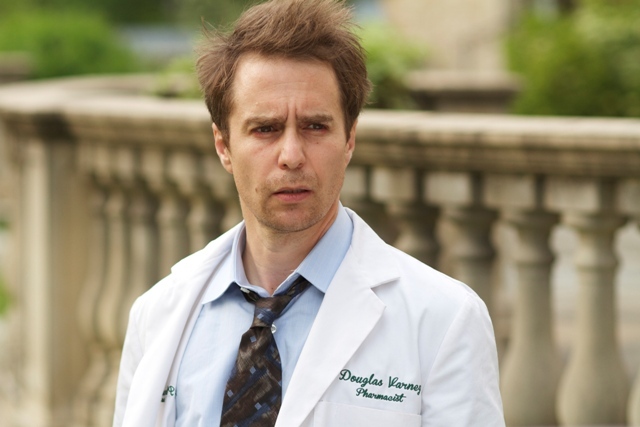 The comedy, set in a sleepy small town, stars Sam Rockwell as Doug Varney, a married pharmacist who gets in over his head in an affair with Elizabeth Roberts (Olivia Wilde), a pill-popping trophy wife. Together they scheme, in a shallow edition of "Postman Always Rings Twice", to kill Elizabeth's easygoing accomplished husband Jack (Ray Liotta). Doug is constantly put upon as a nice guy whose control of his pharmacy is fraught with untimely trips from the DEA and an assorted cast of regular customers. He's emasculated by his workout-addicted wife Kara (Michelle Monaghan), a fervent cyclist who never hesitates to remind Doug who wears the pants in their home. Doug also has an adolescent son going through turmoil, acting out at school. Just about everyone in "Better Living Through Chemistry" is compulsive or has an addiction that defines them. None of the actors have any chemistry with each other. Geoff Moore and David Posamentier write and direct "Better Living Through Chemistry", a film with stale, exhausted comic rhythms meriting a better title. "A Serious Imbalance" is more apt for a film that thinks it is funnier than it is. "Better Living" is top heavy with awkwardness, predictable episodes and a generally bland atmosphere alternating between gloomy and unkempt. The cast, which includes Jane Fonda, whose narration is the film's best asset, is a very good cast from top to bottom but the material the actors wade through allows them little leeway. The characters they play are stock types whose eccentric mannerisms don't enliven "Better Living" as much as its natty opening titles do. (The titles evoke those in "Jungle Fever".) Everything goes downhill after the opening titles in a caper that tries to be part romance, part farce and part offbeat drama but succeeds in none of those realms. That's not to say that one or two moments aren't funny. In the film's closing stages an actor casually delivers a pronouncement that yields laughs. Aside from that brief event "Better Living Through Chemistry" will be very quickly forgotten by those who dare to invest their energy in watching it. Also with: Norbert Leo Butz, Ken Howard, Harrison Holzer, Jenn Harris, Ben Schwartz, Peter Jacobson, Sonnie Brown, Tracy McMullen. "Better Living Through Chemistry" is not rated by the Motion Picture Association Of America, but the film contains strong sexual content, drug, pill-taking, alcohol use and some strong language. The film's running time is one hour and 31 minutes.